PermaGreen Triumph. Photo provided by PermaGreen. PermaGreens are the gold standard of spreader sprayers, with a 20-year proven track record and thousands of machines operating in the field. The Triumph features a fuel-efficient 5.5-hp Honda horizontal-shaft engine and wet clutch, a 150-lbs. hopper and a 1-acre spray capacity. The Triumph also comes equipped with exclusive patented features, including SmartSteer power steering, low-volume spray system, drop-down handlebars and an articulated frame for a smooth ride over rough terrain. PermaGreens can treat an acre in 15 minutes but are also perfectly suited for smaller properties and 36-in. gates. 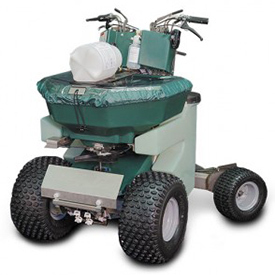 2 Comments on "PermaGreen: Triumph Spreader-Sprayer"
Thank you for your interest in the PermaGreen Triumph. Please contact me at 800-346-2001 ext 105 for further pricing information.